Back in May we changed our name to Welcome Church. That change is part of our new approach to connecting with the people of Woking. 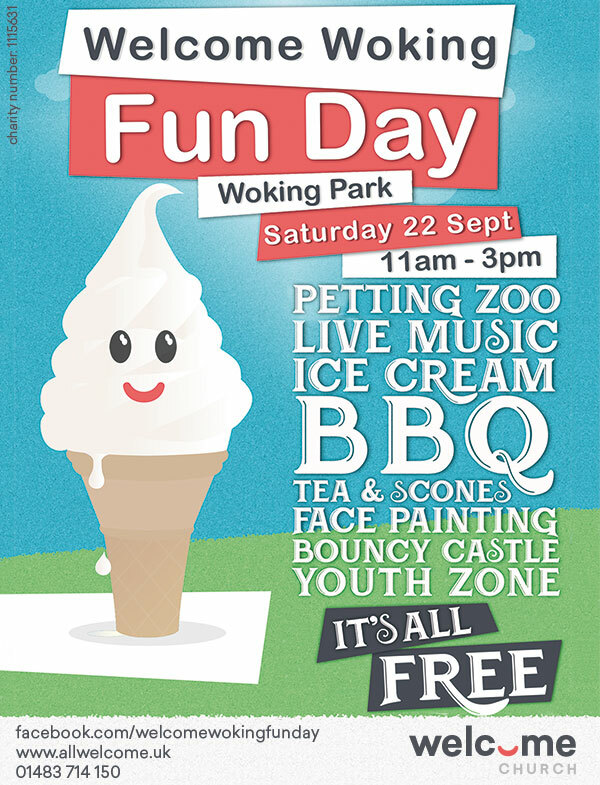 This September we have an awesome event planned to tell the town all about it: the Welcome Woking Fun Day, on Saturday 22nd September, 11am – 3pm in Woking Park. This is a free event that has something for everyone: a petting zoo, live music, ice creams, BBQ, tea & scones, face painting, bouncy castle and youth zone … and it’s all free! For our church this event may be the biggest opportunity in our history to connect en masse with Woking, to bless people in an extravagant way, and to introduce them to Welcome Church. For the people of Woking this is a great chance to have a great day out with their family for free, and to experience God’s lavish and extravagant love first hand through Welcome Church. Share the event on social media: Facebook, Twitter, Instagram – share the event and invite people who live nearby to come along. here is a link to the Facebook event. You can click ‘Going’ and share it as well. Together, let’s try to invite the whole town to this event! People can say a yes or a no; our job is simply to make the invite. And let’s pray that God would draw many to come along and have fun with us … and some may even begin a journey towards encountering Jesus. People don’t care how much we know until they know how much we care. Let’s show the people of Woking our love, care and generosity. It’s a Petch – Forsdyke reunion! Darren is taking on a huge role, and I know he’s well up to it; we worked together for the last 11 years! This will be a huge blessing for the Coign Church and we’re totally delighted to have this wonderful couple on board. During our evening we announced that Nathan Silvester will be leaving us at the end of this year. He and Jules are moving to Alton where he will be joining the team at Harvest Church in Alton as Associate Pastor. Nathan has served us faithfully for more than nine years as our Youth Worker, and is ready for this new challenge. He will be missed! Harvest Church is another Commission Church; its good to remember that we are in mission together as a family of churches. Their last Sunday at the Coign will be January 14th, so don’t miss the chance to say ‘goodbye’ and ‘thank you’ to them both. Ben and Nancy Martin – exciting times! This will be significant change of role for Ben and he will need to work differently; he’s also going to need extra operational support … so maybe Darren is arriving in the nick of time! Ben will be working through lots of other people within the Church to make sure our children’s and youth work are as fantastic as they can possibly be. I know he has a heart full of passion fore young people and ahead full of exciting ideas. Two very key players in all this will now be Ben and Becca Corbett, who will be taking on the primary leadership role for the youth in particular. This is not an employed position, and they will be doing this as volunteers while still doing their day jobs. It was great to hear from Ben Corbett all about how they want to move the youth work forwards, building on the past and taking us into the future. Exciting times are ahead for our young people! Thank you for being receptive to change. Thank you for your commitment to our future. Thank you for coming on this journey together. We are a church that handles change well! And in my next blog I plan to talk about where we’ve got to with our building plans, so look out for that.